On May 26, 2008, the Chinese Culture Center was inaugurated in Berlin with officials from both countries applauding the opening of a new window for exchanges and mutual understanding. The inauguration of the Chinese Culture Center in Berlin marked an important step in cooperation between the two countries. Both Chinese President Hu Jintao and former German Chancellor Gerhard Schroeder attended the foundation stone-laying ceremony of the center in November 2005. Cultural exchanges are of vital significance against the backdrop of increasing challenges to the international community. They are of vital significance to the promotion of mutual understanding and trust between China and Germany, and to the handling of their relations in a correct way. As the third Chinese Culture Center in Europe, the center would serve as a new window onto Chinese culture and a new bridge for mutual understanding. Cultural exchanges can never be one-way and that the Chinese Culture Center will be a window for the German people to understand China and a bridge for friendship with the Chinese people. 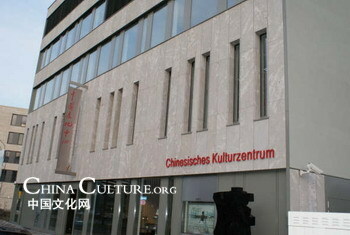 The Chinese Culture Center is located in the downtown Tiergarten area of Berlin, covering 2,800 square meters. Completed in 2007, the center is the third of its kind in Europe, after one in Paris, France, and another in Malta. It will offer a variety of activities, such as film screenings, forums, training classes on Chinese culture and other activities, seeking to reach out to the peoples of Mediterranean and Europe.